Finished artwork by Graham Humphreys for the book cover design for the Paul Davis 2017 publication “Lost In The Shadows – The Story Of The Lost Boys”, the book about the making of the 1987 cult horror film “The Lost Boys”. This limited edition book sold out and is already collectible in its own right. Gouache on watercolour paper, mounted and framed 22 1/2” x 32 1/2” (57 x 83 cm) overall, slight mark to mount. 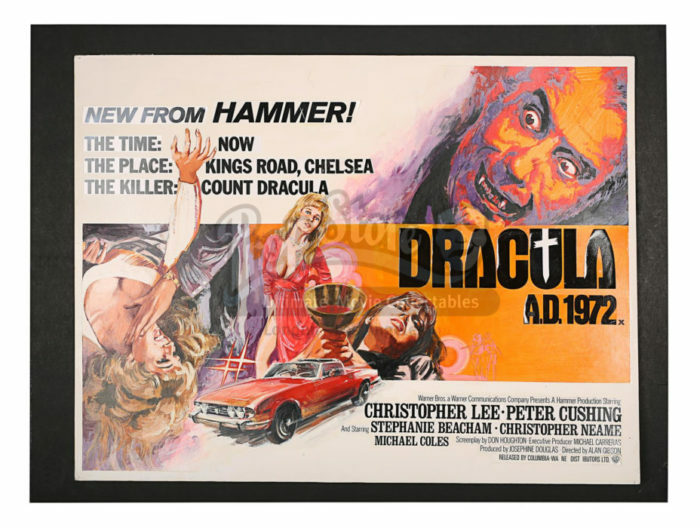 Finished artwork for the 1972 Hammer Horror film “Dracula AD 1972” starring Christopher Lee and Peter Cushing. The film pitched “Dracula” in a modern setting giving Chantrell an opportunity to mix traditional images of gothic horror with snapshots of contemporary “Kings Road” hedonism including a racing Triumph Stag. Although unsigned, Chantrell liked the finished work and had this framed in his home. Relatively little finished Chantrell artwork has survived as much was lost, stolen or binned after use. Chantrell also had a habit of “re-cycling” his work, cutting out pieces for re-use. A fine piece of Hammer memorabilia and a fine piece of surviving Chantrell artwork. Condition: Good. Gouache on artboard with letraset type text overlays, the card painted title script also overlayed and the artwork fixed to a black board. A couple of letraset letters are missing & there is a 1″ tear to upper white border area. This item comes from the official Chantrell archive and written provenance to this effect will be provided. Please note this lot is sold without copyright, reproduction rights, licensing agreements or any other type of legal release. Quad poster image supplied for reference & NOT included in the sale. 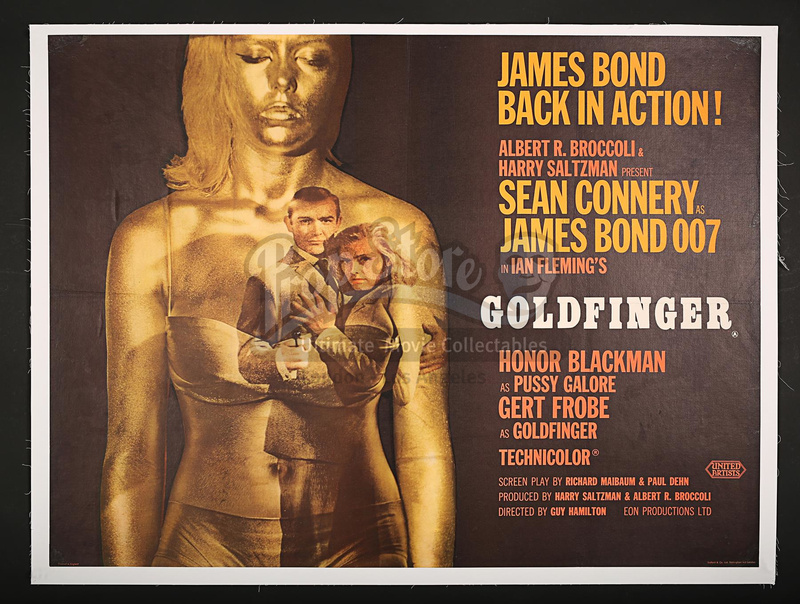 Linen-backed Quad poster for the third James Bond film, “Goldfinger” (1964). Unusually, graphic designer Robert Brownjohn chose a photographic display but the result was nonetheless an attractive stylish poster. Brownjohn was also responsible for the opening credits sequence for “Goldfinger” (Saul Bass similarly collaborated with Hitchcock in this way). Although Shirley Eaton was painted gold in the film, it is believed that Brownjohn used a model for the Quad photograph (Ms Eaton, however, appeared in gold on the cover of “Life” magazine). An iconic piece of Bond poster imagery. Condition: Good. Linen-backed with small areas of restoration to surface paper loss and pin-holes at corners and 2 1/4″ tear to left hand side, the poster with a few light surface marks. Poster slightly lifting from backing in two small areas around Eaton’s left shoulder. Probably the rarest War genre poster in existence. This is a linen-backed Quad for “The Dam Busters” (1955). 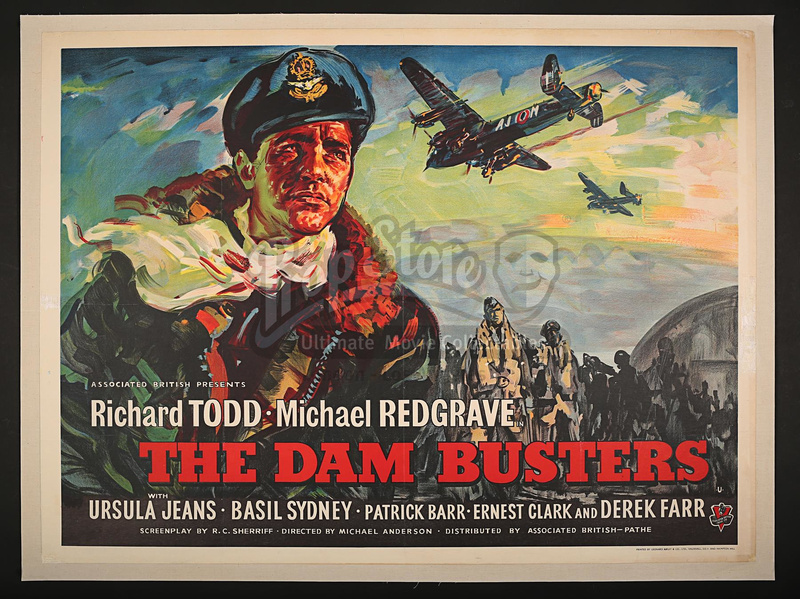 Based on the Paul Brickhill book which detailed the daring raid on the dams in the Ruhr, the film starred Richard Todd as Guy Gibson, the leader of the raid (Todd himself had been a paratrooper and took part in the D-Day capture of Pegasus Bridge). The successful raid depended not just on the bravery of the RAF crews but also the ingenuity of Barnes Wallis who invented the famed “bouncing bombs”. The highly stylised poster illustration shows Guy Gibson, white scarf billowing, with a Lancaster bomber overhead. The identity of the poster artist is unknown though the free-flowing style might suggest one of the Italian artists who occasionally provided the London agencies with artwork from Rome, possibly Angelo Cesselon. Condition: Good. Linen-backed with restoration to 6″ tear from mid left rim and several areas of old tape stains to white rim. 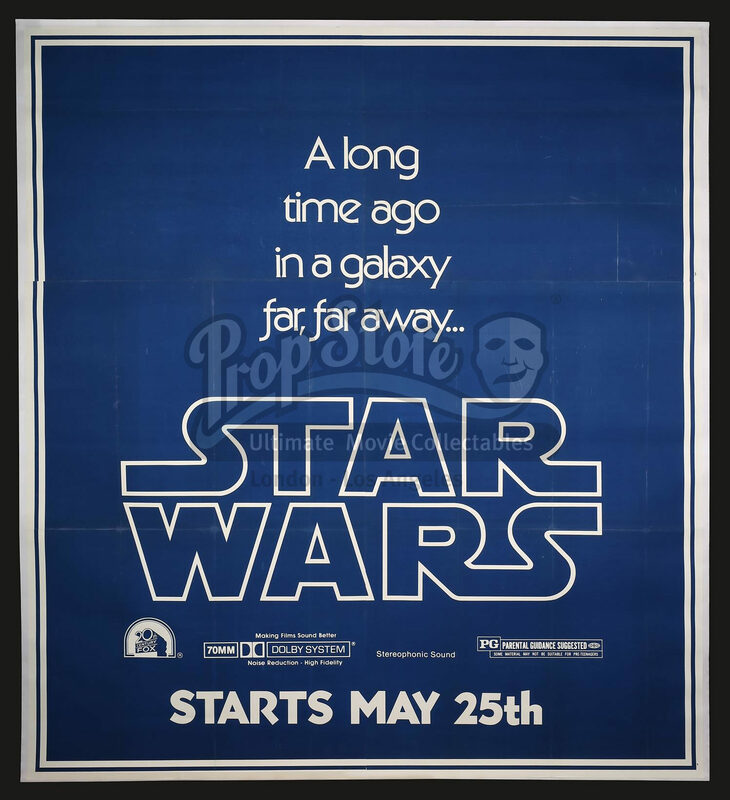 One of the rarest of all “Star Wars” posters, this linen-backed US 7-Sheet Teaser was produced in tiny numbers and is believed to have been distributed to LA, San Francisco and New York only. Very few 7-Sheets have survived and it is possible that this example is one of only two to three in existence. The inclusion of the “May 25th” opening date also distinguishes this poster. The design is simple and to the point and would have provided the public with their first exposure to what evolved into the global “Star Wars” phenomenon. Condition: Good. Linen-backed with some fold-line restoration and surface scuffs but complete. The global phenomenon of “Beatlemania” was in part fuelled by The Beatles’ willingness to give time to perform and provide musical scores for their own films. 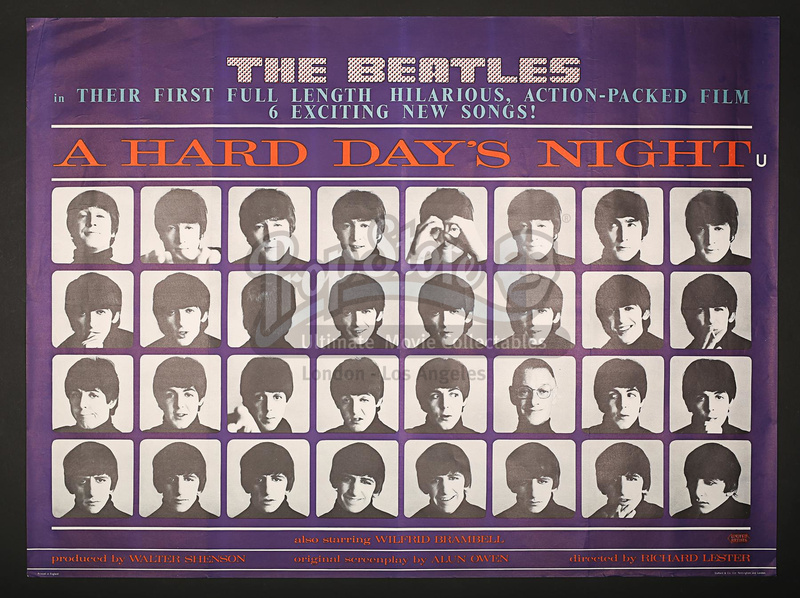 “A Hard Day’s Night” was the debut in the series and the Quad poster was based on Robert Freeman’s design for the LP soundtrack, the light-hearted, cheeky style very much in keeping with The Beatles’ image. Freeman photographed all The Beatles LP covers during the period 1963-65. Condition: Excellent. Near mint and rolled with 3 very faint vertical folds and a small crease top left corner. 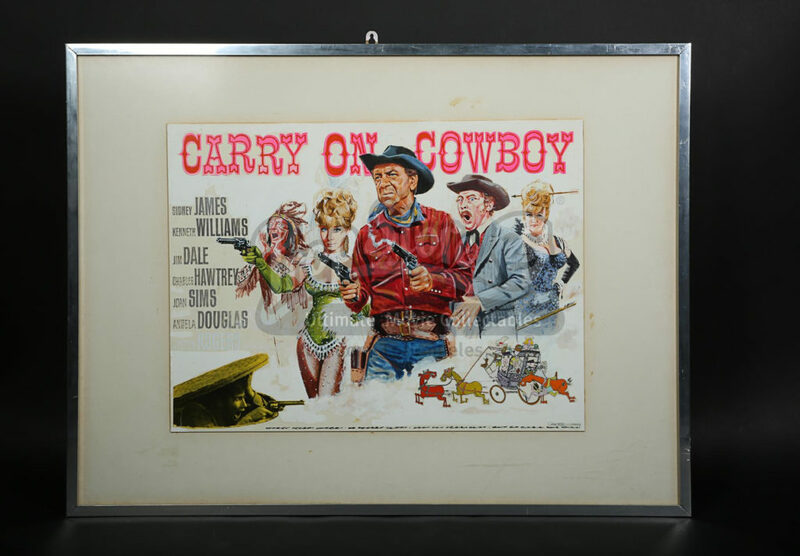 Although this particular Chantrell prototype artwork for “Carry On Cowboy” was unused for the Quad poster (two other Chantrell designs were used instead), Chantrell used the central imagery for the UK 1-Sheet poster design. This piece provides a good example of the flexibility Chantrell demonstrated in his work. Although the layout is mostly painted, Chantrell added a tinted photo of Jim Dale (bottom left). In addition, cartoon art (bottom right) was also added, this being provided by Chantrell’s colleague Colin Leary. Condition: Excellent. Mostly gouache on artboard with painted day-glo cut-outs for the title and further cartoon and photographic cut-out additions. The item has been framed and glazed and signed by the artist as “Chantrell – Leary”. This item comes from the official Chantrell archive and written provenance to this effect will be provided. Please note this lot is sold without copyright, reproduction rights, licensing agreements or any other type of legal release. UK 1-Sheet poster image supplied for reference & NOT included in the sale. 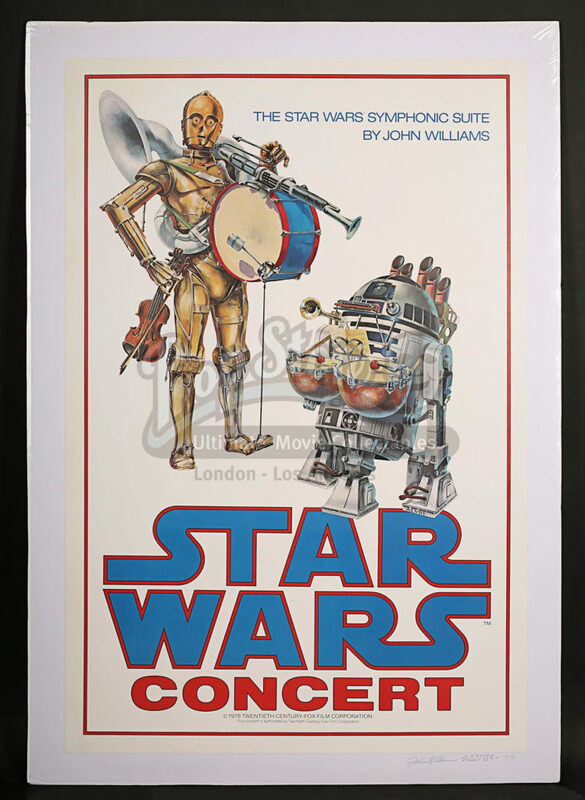 From the collection of “Star Wars” producer Gary Kurtz, this is a rare linen-backed “Star Wars” concert poster. Though ostensibly advertising the John Williams “Star Wars” concert at the Hollywood Bowl in Nov 1977, this limited edition poster was created in Spring 1978. The poster features artwork by John Alvin and the artist signed a number of those printed. This poster carries both Alvin’s signature, his distinctive printed name and has been additionally dated “1978”, these annotations are not to the poster itself but to the lower right hand border of the linen-backing. Rare in any condition but this example is near mint. Condition: Excellent. The poster is in superb near mint condition with no discernible faults. Please note that this poster is currently cellophane wrapped and has been photographed as such. Superb silk-screen printed limited edition poster for a special 2010 one day viewing of Kubrick’s brilliant but controversial film “A Clockwork Orange” (1971). This was one of just 175 posters printed (# 138/175) in 2010 and presents an ingenious re-interpretation of the work. The poster has been signed and numbered in pencil on the bottom rim by the artist David O’Daniel. Condition: Good. Slight marking to upper. 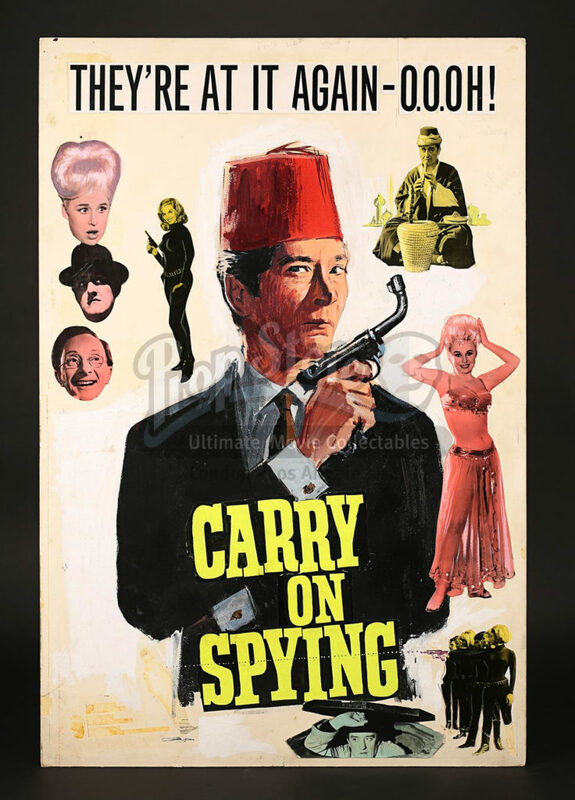 Finished Chantrell artwork for the UK 1-Sheet poster for the 1964 James Bond spoof “Carry On Spying” (an acetate overlay carrying further text would have been applied prior to the artwork being photographed for poster production). As with “Carry On Cleo” (1964), Chantrell was forced to amend his original artwork to avoid legal complications. The “bent barrel” Quad poster was amended to “straight barrel” but for some reason the UK 1-Sheets were printed “bent barrel” style. Artwork a mixture of gouache, day-glo card (title script), tinted photographs and printed text to upper, all affixed to board, slight damage to photo bottom right. This item comes from the official Chantrell archive and written provenance to this effect will be provided. Please note this lot is sold without copyright, reproduction rights, licensing agreements or any other type of legal release. Linen-backed Quad poster for the first “Dr Who” film, this starring Peter Cushing as the Doctor. 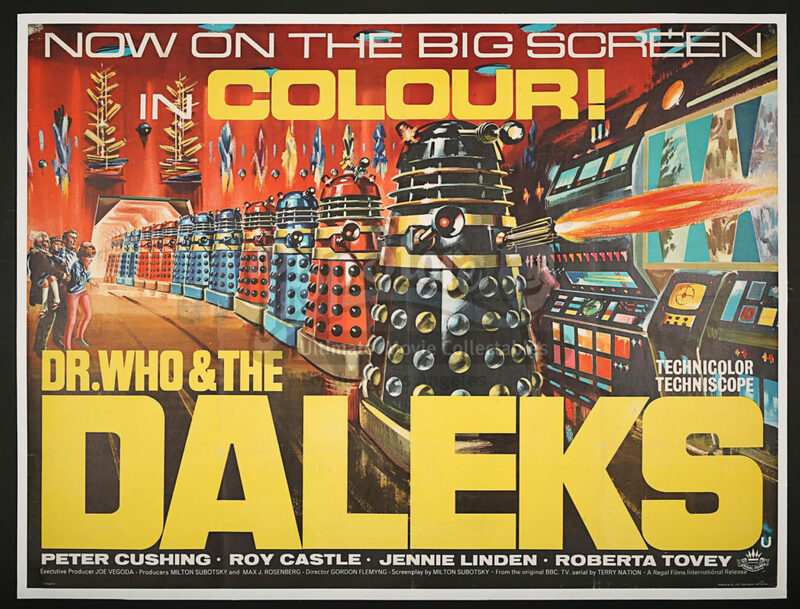 The fabulous Bill Wiggins artwork gives overwhelming prominence to a phalanx of advancing “Daleks”. Based on the successful BBC TV series (shown in black and white), the poster celebrates the fact that the movie is in “COLOUR!”. Condition: Good. Linen-backed with minor restoration bottom left corner, light fold-line wear, a few very light surface scuffs and pin-holes/marks to corners. 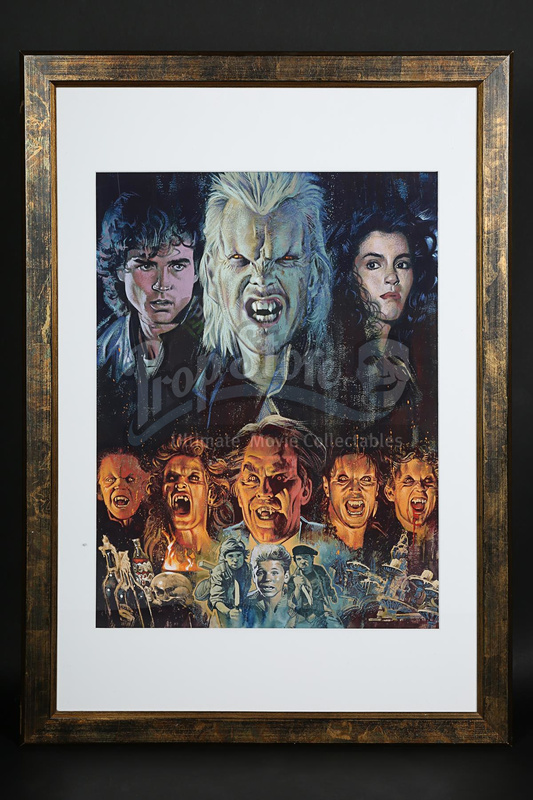 If you liked what you saw, then why not check out some of the amazing pieces of original art and collectable posters all currently up for auction in the Prop Store Cinema Poster Live Auction, and find yourself your very own piece of movie art history. 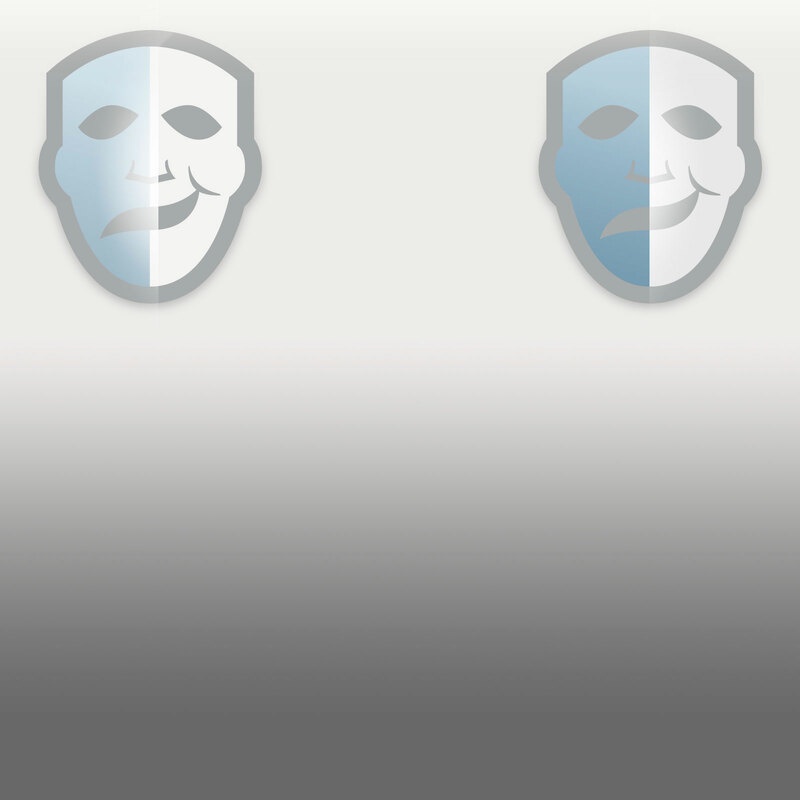 Thank you so much for sharing this post.All the post shared over here is really good and valuable.I do stop by here whenever I feels like I need some information about the topics mentioned over here. Capacity barters don’t occur constantly. They just happen when a capacity organization has enough units to make it worth their opportunity to have a closeout organization sell off them off for them, to recover the back lease that was not paid on the units.